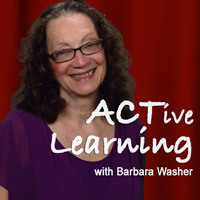 Barbara Washer is a Theater Educator/Director and pioneer in Arts Integration with almost three decades experience working with students in the classroom and on stage. She holds a BA in Speech Education and an MA and MFA in Theatre; has directed over 60 productions (many original plays created with students and professional artists); and designed arts programs for schools, theaters, and community organizations. She collaborated with classroom teachers, arts specialists and students at Renbrook School and Renbrook Summer Adventure for 23 years, developing curricular and performance opportunities for every child in grade 1-9. At the heart of her work is a passion for providing creative theatre-based opportunities for all students, guiding participants to take responsibility in their own learning process, and supporting the work of teachers and artists. Currently Barbara is a Teaching Artist for Hartford Stage, Acting Coach for Windsor PeeWee and Youth Theatre (K-12), Director/Drama Instructor for Windsor Department of Recreation and Leisure Services, and Costume Coordinator for Watkinson School. With Hartford Performs, Barbara has served 26 Hartford Schools in 65+ residencies as well as the Summer Arts Literacy Program, and recently completed the John F. Kennedy Center’s Artists as Educators Seminar “ Mapping the Journey: Planning Effective Residencies for Students”. Barbara’s ACTive Learning Through Drama programs offer a student-centered approach to Arts Integration by combining a proven process for engaging students with flexibility for teachers to collaborate and adapt topics and learning outcomes for their students.